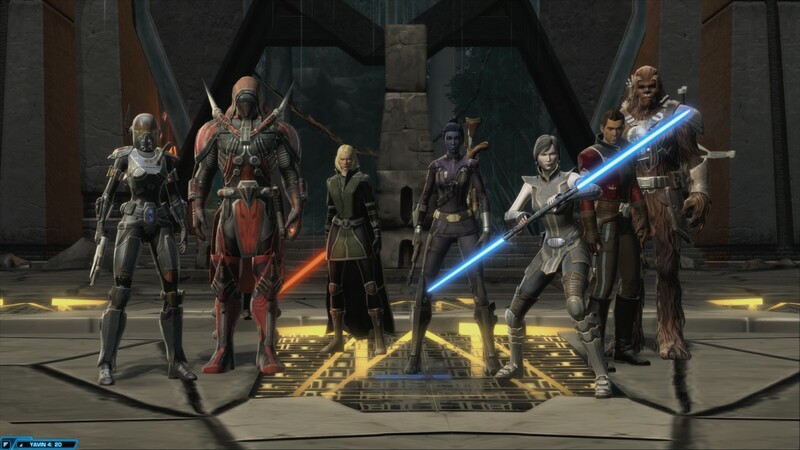 Having had my fill of dallying around with various class stories, I decided it was finally time to move on to the post-launch content in Star Wars: The Old Republic. While I briefly considering bringing another character forward, it didn’t take much soul-searching to determine that my Imperial agent was the character I wanted to continue on with. Cipher Nine is back on the job! Before moving on to expansions, I had one more piece of launch content to do: the Ilum story and its associated dungeons. I found it all more confusing than anything. I had taken Malgus to be the main “hero” of the Empire side, and his betrayal came completely out of left field. And I don’t understand why I was fighting him. I wanted to join him. He seemed a lot more on the level than most Sith. At least it didn’t take much time. To put it mildly, I didn’t have high expectations going into Rise of the Hutt Cartel. I hadn’t heard much buzz about in the community, losing the unique flavour of the class stories was bound to be a disappointment, and… well, seriously, Hutts? However, the Makeb storyline proved to be a very pleasant surprise. Oh, maybe it’s not on par with the agent storyline, but it’s still very much a strong story. 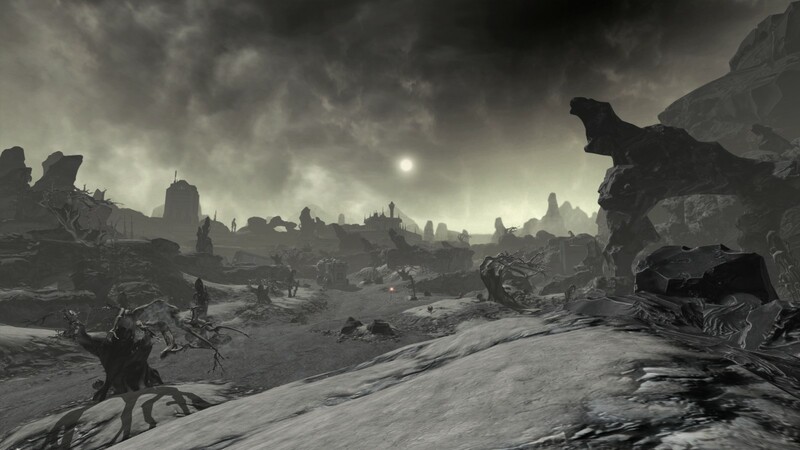 I know I keep saying this, but once again I’m struck by how unlike Star Wars SW:TOR feels. Makeb feels more like a sci-fi James Bond movie, all intrigue, infiltration, and tense action. Maybe it wasn’t Shakespeare, but it was exciting. Well-paced, too. 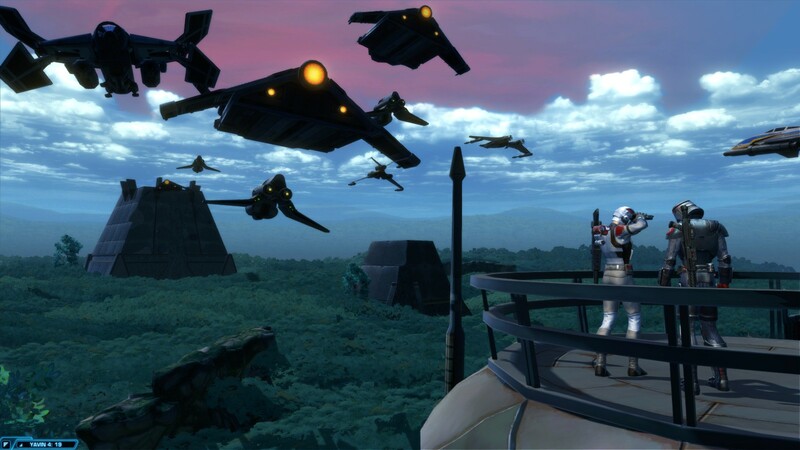 I’m not sure if Makeb was stream-lined by Knights of the Fallen Empire like the base game, but I didn’t encounter much in the way of filler, and it was easy to skip what I did find. You can just leave the handful of side-quests be and focus on the main story without missing much. Provided you don’t need the XP, anyway, and maybe not even then. It probably helps that I’m playing an agent. 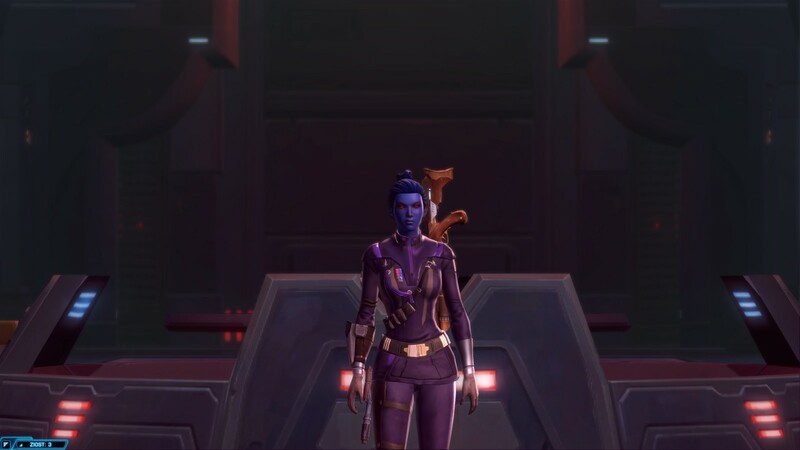 The flavour of the Makeb story fits perfectly with the Imperial agent class, to the point where if I hadn’t known better I might not have even realized this wasn’t a continuation of my class story. I can’t speak to the Republic version of events, but something else I liked about Makeb was how it subtly but noticeably put a more positive spin on the Empire. It didn’t make them out to be saints — nor should it have, as that would be too much a stretch — but it does show they’re not just monsters, either. Cytharat’s honour-bound mentality was a refreshing take on the Sith, and even if it’s more out of necessity than altruism, it was nice to see the Empire softening on their anti-alien mentality. On the whole, the Imperial NPCs on Makeb all feel like real, multi-faceted people, not just goons for the Dark Council. Niar in particularly is another great example of Bioware’s character writing. She’s really a pretty nasty person, and I shouldn’t have liked her… but I did. Quite a lot. I also found Makeb to be a significant visual upgrade compared to the base game. 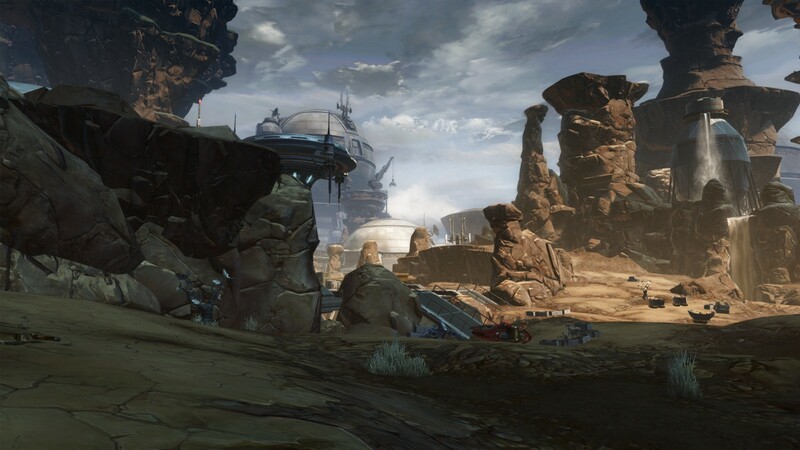 SW:TOR’s graphics have always been very below par, and Hutt Cartel didn’t entirely change that, but Makeb definitely looks better than the base game’s planets, and in particular I noted the cutscenes were much better — more cinematic and with more natural-looking animations. That said, while Makeb was good fun, Oricon was less impressive. It represents one of my most hated concepts in MMO gaming: a storyline which has been entirely solo-friendly up until the climax, which requires a raid group. The good news, if you can call it that, is that it wasn’t a very interesting story to begin with, so I’m not heartbroken over missing the ending. Thankfully, Oricon was over quickly and did not waste much of my time. Shadow of Revan was more of a mixed bag. My big problem is that I barely know who Revan is, and I care even less. From what I gather, he was some sort of major figure in the old Knights of the Old Republic games, but I never played those, so to me, he’s just some crazy weirdo in a mask. Without any context, he’s a very dull character. Also, there’s two of him, apparently? Confusing. I’m not entirely fond of the alliance, however temporary, between the Empire and Republic, either. Normally this kind of “bitter enemies putting aside their differences in the face of a greater threat” story is something I love, but this is one of the rare cases where the factional divide in an MMO actually has a good lore justification. And I don’t want to associate with those dirty Pubs. I wasn’t too keen on how much of the expansion’s story was told through dungeons at first (even if they are soloable), but SoR’s dungeons are far quicker and less tedious than those in the base game, so it wasn’t that bad in the end. Rather liked the Manaan one. Blood Hunt was total filler, though. That said, there’s also a lot I did unequivocally like about Shadow of Revan. Once again the story feels very cloak and dagger, and totally appropriate for the agent. It’s once again hard to tell the class story ever ended. I’m starting to think the Imperial agent was meant to be the main character for the game, and the other classes are just side content. 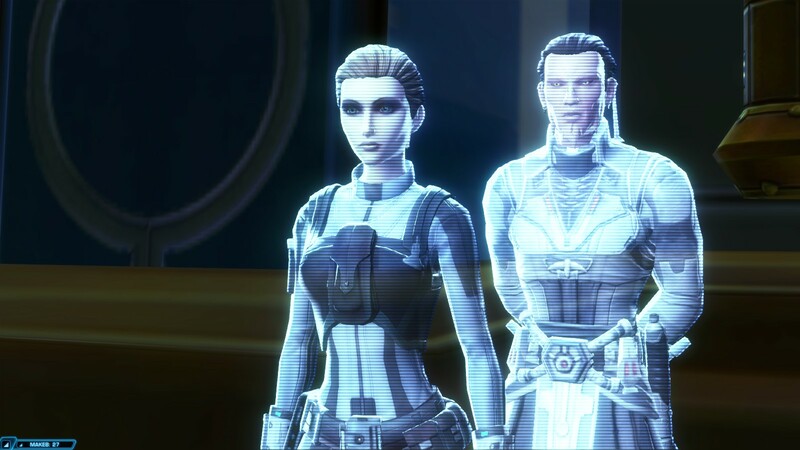 The story is well-paced, and once the bits with Revan are done, it really hits its stride. Ziost is possibly the highlight of the game to date — it’s at least on par with the best parts of the agent storyline, anyway. More than ever I see nothing of Star Wars in this game. And again, coming from me, that’s praise, not criticism. I see no common thread (beyond the superficialities) between the smart, intrigue-laced sci-fi that is The Old Republic and the simplistic adventure that is the film franchise. The character of Lana Beniko was also a highlight of the expansion. I find her quite fascinating. A good(ish) Sith is not too far-fetched, but a dispassionate Sith? Now that’s unexpected. I really want to learn her history, and what makes her tick. How did someone like her get where she is in the Sith hierarchy? Is there some furious cauldron of passion beneath her icy surface that she somehow keeps under wraps? Is she just a natural savant with the Force? Is she so cunning she doesn’t need raw power? There’s something about her speech pattern that reminds me of myself, too, which is strangely fascinating. I’m not used to seeing anything of myself reflected in video game characters. Especially not in ones that aren’t villains. And she’s the perfect counterpart to my agent. Lana works within the system, and Cipher Nine works outside it. Lana is the Gordon to Nine’s Batman. 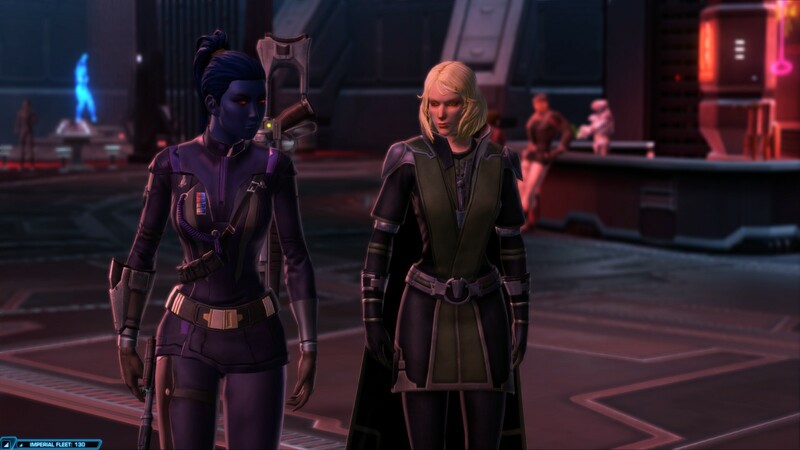 As for her Republic equivalent, I don’t mind Theron Shan as a player (though I’m not a particular fan either), but for RP reasons, I’ve decided Cipher Nine hates his guts, and it’s amusing to constantly put him down and argue with him. I especially like getting all jealous and possessive where Lana is concerned. Beyond the story, Shadow of Revan was a mostly solid experience in terms of gameplay, as well. The pacing is good — without too much filler — and the quest design is slowly getting better, with better story-telling mechanics and more diversity of gameplay. I was particularly impressed by how the daily quests on Ziost manage to provide a satisfying experience with almost no combat. The loneliness and lack of enemies serves the story very well, too. And the graphics continue to improve. Yavin 4 is the first area in the game to date where I’ve found myself pausing to admire the scenery. Most of SW:TOR ranges from ugly to barely adequate, but Yavin is genuinely pretty. I especially like the sunbeams and other lighting effects. Despite some hiccups, I’m gonna chalk Shadow of Revan up as a win on the whole. Its earlier parts were weaker than Hutt Cartel, but it sure ended on a high note.